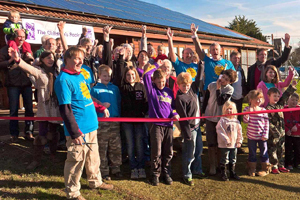 BE members and guests celebrate the launch of our first community-owned solar power station on 28th January 2012 at Wiveliscombe Children’s Centre. It was a lovely sunny day, the event was covered by local press, radio and TV and all had a great time. Also see installation photos and updates on the performance of this installation.